In Barry Allen’s monologue in the beginning of the show. He said he always dreamed of doing the impossible. Then he became the impossible. He became the fastest man alive. I don’t mean Usain Bolt fast either. 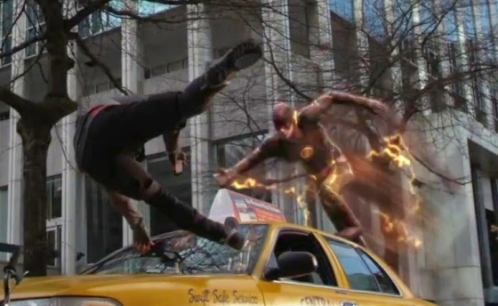 In the show he became The Flash from lightning that hit him after an explosion from the particle accelerator in S.T.A.R. Labs. He uses his enhanced speed to save his city from other enhanced humans, or meta humans as they are being called in the show, and to solve the mystery of his mother’s murder. The thing is that when Barry Allen asked if you can believe in the impossible it occurred to me that someone else made the same statement in the Bible.We now come to the book of Luke where Jesus just finished speaking to the rich young ruler(Luke 18:18-30) which will be covered at a later time. Jesus was asked “Who then can be saved?” (Luke 18:26). Then Jesus asked said the same exact thing that the Flash said at the beginning of the show. The idea of eternal life is an impossible idea. Thankfully Jesus informed us that with God nothing is impossible. The idea opens up your mind and your spirit to many ideas that you couldn’t quite fathom. How many of us have dreams and goals that we said would be impossible for you to obtain and accomplish. To be a CEO for a fortune 500 company. To have 500 churches and spread the word of God throughout the world. To find someone that will love them as much as they could love. We all have impossible dreams we all wish to accomplish. We have to remember however that with God all things are possible where with man it isn’t. Proverbs 3:5-6 – 5 Trust in the Lord with all your heart and lean not on your own understanding; 6 in all your ways submit to him, and he will make your paths straight. We have to keep God first and all of his commandments and you will see the impossible happen in your life. Just like Barry Allen became The Flash we can also attain the impossible. Thank you Heavenly Father that you make a way where there is no way. Thank you for making the impossible possible in my life. I promise to be obedient and follow your word and your will so I can continue to experience the impossible in my life. In Jesus Name, Amen.